Ok, this is my new toy, it’s ace. 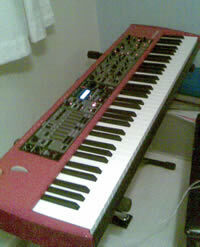 I upgraded to this after owning and playing a Roland FP-2 for about 5 years. What a difference! I opted for the 76 key version mainly for portability/weight. It’s the perfect tool if you play in a jazz-funk band like I do! The Rhodes sounds are simply stunning – crank up the Leslie amp simulation and I just want to keep playing! If there’s anyone else out there who has one and wants to pass on a few tips on getting the VERY best out of it, then drop me a line below.